King of Slots - Get The Best Slots Experience Online! Game Information: Play King of Slots for the chance to become the king of pokies. This royal game is powered by NetEnt and combines simplicity with attractive features for a fun and rewarding experience on the reels. King of Slots is a five reel, 26 payline video pokie that is ideal for newbies looking for a simple yet exciting step into online gambling. During this game, players can enjoy Sticky Win opportunities and well as the chance to claim some fantastic free spins. 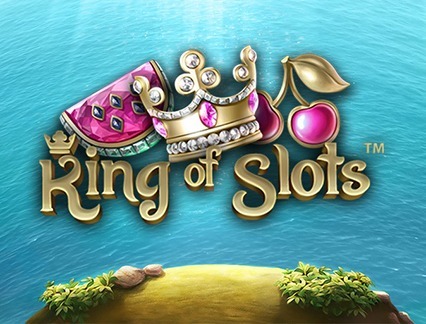 Set against a blue sea background, King of Slots can be played for free or for real money. King of Slots features five reels and 26 paylines. The reels are gold-rimmed to add to your royal experience, while a host of theme-appropriate, fruity and traditional symbols populated the reels including a crown, a watermelon, a lemon, cherries and card values 10, J, Q, K, and A. The big blue ruby is the wild and replaces all symbols on the reels except the diamond scatter. This exciting NetEnt offering has combined to classic pokie elements, i.e. fruit and jewels to create this sensational game. The game boasts a variety of features like wilds, sticky wilds, and a bonus round where you can win between five and 30 free spins and the chance to triple your wins. This game is rich in colour and graphics, with fruity symbols and royal icons populating the reels as you play. The game pays homage to the classic pokie machines of the past, making it an excellent choice for those in a nostalgic mood. 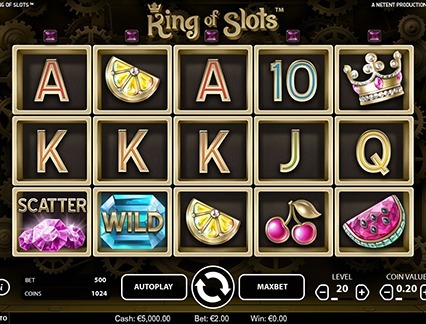 King of Slots is a medium variance game with potential wins of up to 3 000x your initial bet. That being said, players can expect even more win thanks to the lucrative free spins feature. King of Slots has two bonus features that add some excitement and rewards to your gameplay. The Sticky Win feature is activated whenever you have a winning payline or you land three free spin symbols. Winning symbols will be frozen in place and the reels will spin one more time for even more winning opportunities. The reels will continue to spin as long as new winning combinations are formed, which could see your wins increase nicely. The second bonus is the free spins feature, which is triggered when you land five scatter symbols. Five symbols you earn five free spins, while six triggers 15 free spins and seven triggers 20. Eight scatters will give you 25 free spins and anything between nine and 15 scatters will earn you 30 free spins. All wins during the free spins feature are subject to a 3x multiplier. This feature can also be retriggered.